Have you heard of zucchini “pasta” yet? There’s a reason it’s all the rage. I discovered the zucchini “pasta” trend while perusing Pinterest. I love zucchini and I love pasta how could this be bad? If you haven’t made zucchini noodles you are missing out. They are full of flavor, tender and not to mention are gluten free and vegetarian! Instead of regular pasta. zucchini is cut into the shape of noodles with the help of a Vegetable Slicer. They are a great way to sneak in some vegetables into your diet. 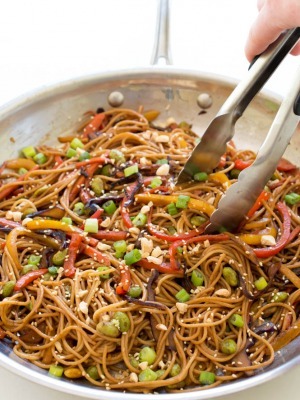 The noodles are then tossed with a simple homemade tomato sauce. 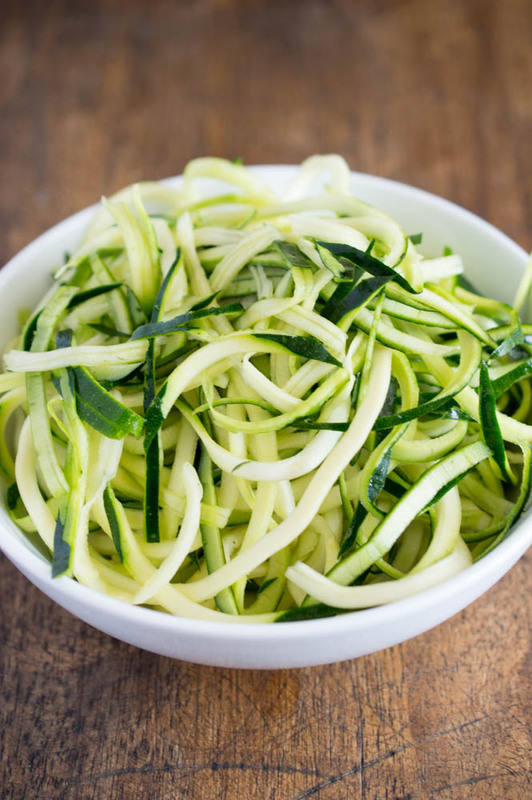 You can enjoy these zucchini noodles raw or cooked. To make the zucchini pasta you need a Vegetable Slicer. A mandolin would also work great for this. I like to leave the skin on the zucchini for the color and added fiber. Zucchini has a lot of moisture inside and tends to make the sauce watery if you don’t get the excess moisture out. I like to sprinkle a little salt on the noodles and let them drain for 15 minutes. Toss a couple times and squeeze out any extra moisture. Make sure to taste the pasta with the sauce before seasoning with extra salt and pepper. 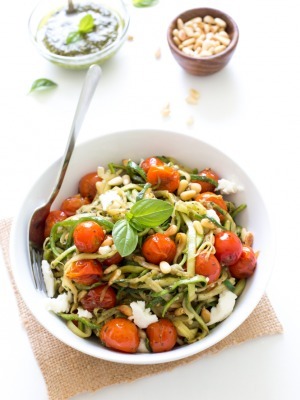 Serve this Zucchini “Pasta” with Tomato sauce for dinner tonight or as a light healthy lunch. Place zucchini noodles in a colander and sprinkle with salt. Allow the zucchini noodles to drain. Toss and squeeze out any extra moisture. Set aside. Add oil to a large saucepan. Add is onion and cook for 2-3 minutes until tender. Add in crushed tomatoes, oregano and red pepper flakes. Bring to a light simmer and cook for 10 minutes. Add zucchini noodles to the sauce and cook for 2-3 minutes or until tender. Season with salt and pepper if desired. Serve immediately. 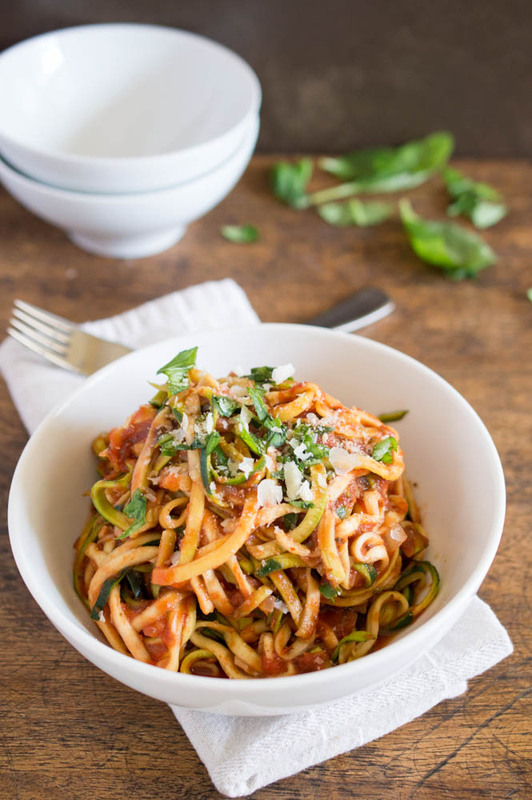 Never made zucchini pasta before, this is definitely something delicious I need to try! Yes you should definitely give this pasta a try it is delicious! Enjoy!! Thanks Claudia. It’s a’lot better when you let the zucchini drain out any excess moisture. Hope you like it! Thanks Paula!! I hope you enjoy! love love LOVE zucchini noodles. beautiful photos! 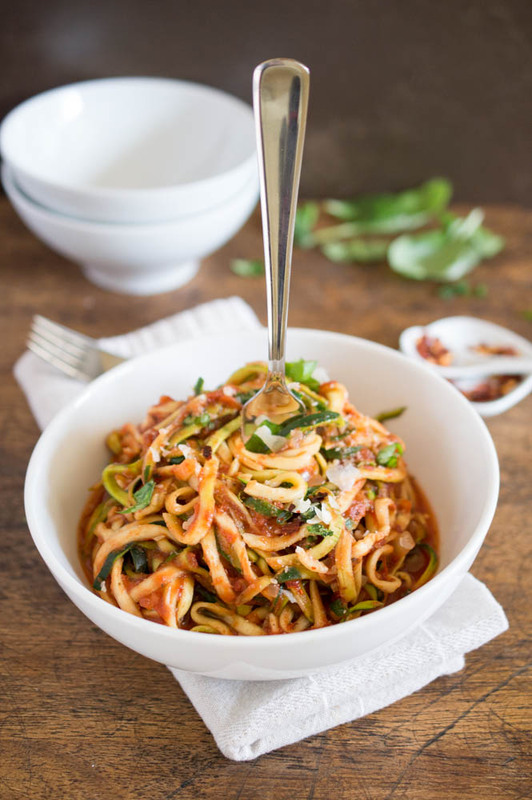 I used this recipe for my first try with spiralized zucchini…and I LOVE it! This is really simple and delicious and low-cal. Thanks for sharing! I am so glad to hear you liked it Whitney!! Made this tonight for my first try with zucchini spaghetti and it was a big hit! I added homemade turkey meatballs and will definitely be revisiting this combo often for quick healthy dinners! Thanks for sharing! 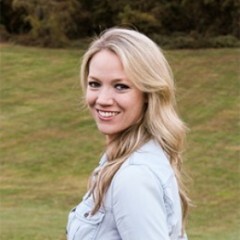 So happy to hear that Jessica! Glad you all liked it! Made this tonight with my Paderno spiralizer, 2nd recipe ever. It was amazing. I’m Italian and my idea of a serving of pasta is probably equivalent to 5-6 servings so I basically avoid pasta since I’m a carb freak. And while the newer wheat pastas are ok still not saving a lot of carbs or calories. Loved, loved, loved this. didn’t even miss the pasta. Of course I had to play with sauce just a bit and added turkey sausage but now I can have my spaghetti again! Thank you! I’m so glad to hear you liked it Renee!! Just made this tonight and it was delicious!!! I added 4oz of slow cooker pulled pork, which complimented the dish so much! I know there are 4 servings to this…..but does anyone know the serving size?? 1 cup? 1.5cups? etc etc….. So glad you liked it. Pulled pork sounds awesome with this! I would say about 1 cup per serving. There are about 4 cups of zucchini added to this but it tends to shrink in size after salted. After years of avoiding zucchini, because it always was mushy or bland, I tried this recipe. It was a big hit with my family. Delicious! I followed the recipe as presented. The only change would be to increase the quantities, so there is more to eat! I am so glad you liked it Paula! Simple and delicious! ! This will be my go-to zucchini pasta. Thanks! I was wondering if you can make these noodles and let them dry to have on hand for winter when they cost more in the stores. ..than just run how water over them to “cook” them for pasta meal and maybe refrigerate to make pasta salad.?? I am not personally familiar with dehydrating the zoodles but found a good site that breaks down how to do it! How do you crush the tomatoes? I either by a can of crushed tomatoes or crush whole tomatoes with the back of a wooden spoon. Hi! I’ve always wanted to try zucchini “pasta”. Today I tried your recipe, it’s absolutly delicious! So delicious!!! I found this recipe in a panic after loosing my previous one into cyberspace. Apparently I didn’t need to go look for it…found a better replacement. I used my own basil, garlic, tomato sauce and just added it to the onions and garlic then followed the rest as directed. I think I would do it this way again because i just heated up the sauce once our guests arrived, threw in the drained zucchini, etc. And it was served in less than 5 minutes to perfection. The leftovers were outstanding so go ahead and make a mammoth pot of this stuff when your neighbour brings you a mammoth zucchini. I made it alongside a salad and cauliflower crusted margarita pizza cut into appetizer sized pieces. What a healthy meal! Hi! 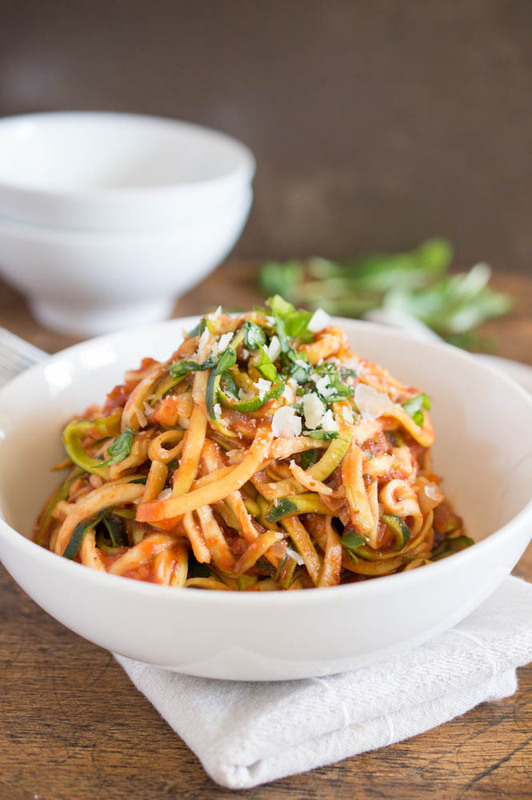 I’ve been dying to try zucchini pasta and this recipe sounds absolutely amazing! I am looking to be very specific with my macronutrients, using a plan I am counting them similarly to calories, and I would like to know what is considered one serving? Is it like four ounces? are you kind of just eyeing it? Thanks! I am kind of eye balling it so it is hard to say I’m sorry! I would do about a regular bowl of this as a portion. Or divide the recipe into four portions. Can you freeze the zucchini for future use? I personally have not tried freezing this. I think it should work out fine if freezed with the sauce. Sounds delicious! We are on a salt free diet is there another way to get the moisture out of the zucchini without salt? You could always just try to get any excess moisture with some paper towels. It is fine if there is still a bit of moisture.